I’m just gonna come out and say it….I like old people. I like them a lot. I feel like I can learn from them and I like their stories. It’s been that way since I was little. The 90-year-old ladies in the nursing home when we’d visit old Aunt Carribell a few times a year….I knew them all by name when I was five. The 80-year-old janitor at my grade school….became my friend who’d stop by at Christmas time each year to visit. I could look at it as an inherited trait, as my parents always spent a lot of time with friends that were much older than them, and I’ve grown up doing the same thing. I would have to say it started for me with my grandma, though, my mother’s mother, known as Gommy to us grandkids. She sparked something in me to appreciate the beauty in people, in all people. She was the kindest, sweetest, most nurturing soul I’ve ever come across in my life. She exuded caring. I don’t remember her ever saying a mean thing about a single person. She died when I was only 8, but my memory of her is as strong today as when I last saw her in person 34 years ago before she passed. I truly believe the soft part of my own soul, that part that some who don’t know me well, might doubt actually exists, came directly from Gommy. I craved being around her when I was little; I wanted to spend every minute with her. Gommy’s sincerity and compassion was contagious. It spread like osmosis to those who surrounded her. She was one of those far-and-few-between humans that challenged people around her to be better people without ever opening her mouth. I wanted to be just like her. I’ve probably been subconsciously trying to fill her shoes ever since she left this world. The old man at the bus stop….I’m on it! I’m on a first-name basis before we even make it onto Lake Shore Drive from Mag Mile, talking about things from “back in his day.” The elderly waitress at The Melrose who used to serve us breakfast at 4am after the bars closed, back in the day, I find myself picking her up in front of her retirement village to go grab dinner (at 3pm, mind you), where she fills me in on all the handsome men she’s courted over the years. It’s become somewhat of a joke with my friends who don’t understand my running with the geriatric set. I have a fascination with people who lived before me….people who have done things in their lives that I never have, nor probably ever will do, in my own life. Listening to their accounts and adventures adds to my life. In turn, they give me a new perspective on my own experiences. I learn, I absorb, I accept. They teach, they impart, and they share. We all benefit. While I do not discriminate in my affinity toward older friends and develop relationships with both the sexes, I am definitely more inclined toward women. Maybe it’s because my Gommy was a woman, or maybe it’s because my whole world was female when I was a kid, with my mom and her tight circle of friends, or maybe it’s just because I consciously like women more, but in any regard, I gravitate toward them. In fact I go out of my way to make connections. 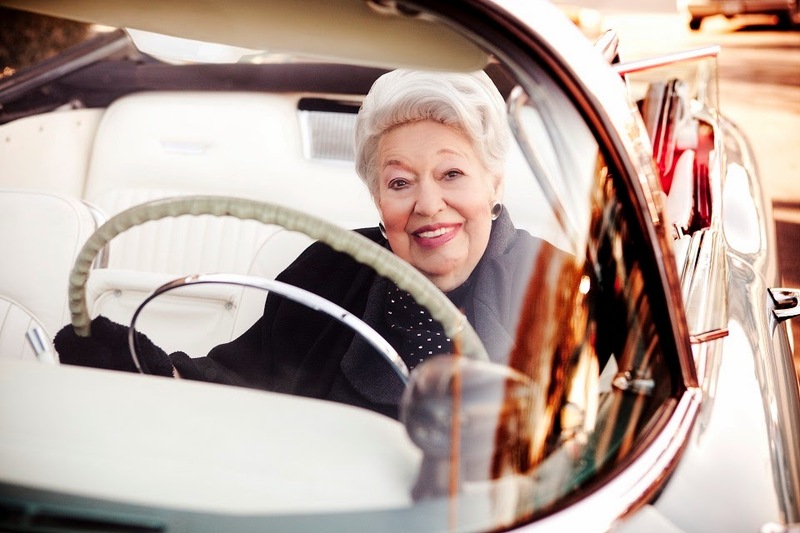 Take Ebby Halliday, for example, the First Lady of Real Estate in Dallas, who just turned 103 this past weekend, and is known for her 95-years-in-the-making business saavy. I went to interview as an agent with her real estate company when we lived in Texas. I didn’t want to work there. I could never have kept up with the dress code or height of the hair or shine of the nails at her company. I interviewed for the sole chance of meeting the queen bee herself! I read about her and knew she went to the office every morning, even in her 90’s, so I arranged for a morning appointment. Yes I got to meet her and yes she was lovely. And of course she had a story and tidbit of knowledge for me to add to my inventory. I have lots of friends my own age, some a little younger and some a little older. I am challenged by them also. But it’s a different kind of learning I do with them. I’m in their world. I can mostly grasp all of the situations they encounter in today’s society, even though we may be different as night and day. But hearing about an event or a personal reaction to an event that happened in a completely different generation is amazing to me, as I feel like I’m getting something I could never get from a book or a documentary. I’m getting a live account, accompanied by perspective. That perspective helps me keep my own in line. Whether it’s drinking cranberry toots with Grandmommy, my other grandma, and her cronies at the Legion, purposely lunching with the oldest ladies in the office, or hanging pictures of Barbara Bush all over the walls of my college dorm room, I am chasing the wisdom of a different age. I wonder at what point, the tables will turn and I’ll be at that age of distinction?